The Logic of Connective Action: Digital Media and the Personalization of Contentious Politics. W.L. Bennett and A. Segerberg. Cambridge: Cambridge University Press, 2013. 240 pp. The Logic of Connective Action asks a timely question, namely ‘how digitally networked action works in an era of increasingly personalised political participation’ (p. 211). The book’s premise is that the long-term decline in membership of civic and political organisations observed across the West, along with a ‘personalisation’ of lifestyles and media practices, suggests people’s engagement (or not) with politics may have changed. 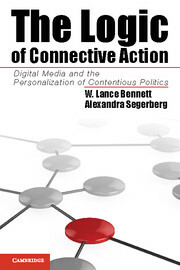 To explore this shift, Bennett and Segerberg coin the concept of ‘connective action’, a form of contentious action based on sharing personalised contents through social media. This they contrast with an earlier logic of collective action that relies on the formation of collective identities. The challenge for ‘connective’ action networks is not how to get individuals to contribute to a cause. After all, people are already routinely contributing their free labour, or ‘sharing’, through social media. Instead, the challenge is how to turn that sharing into ‘public engagement, policy focus, or mass media impact’ (p. 58). More often than not, argue the authors, part of the answer is not to subsume individuals under a collective identity but rather to get them to share ‘personal frames’ derived from inclusive ideas, e.g. variants on the “I am the 99%” meme. Chapter 1, ‘The logic of connective action’ develops a three-part typology of collective vs. connective action (see the helpful diagram on p. 47). In contrast to the collective action of ‘organisation-brokered networks’, two different types of connective action are introduced: crowd-enabled vs. organisation-enabled action. The Occupy movement is a crowd-enabled action network, whilst the London-based coalition Put People First (PPF) typifies an organisation-enabled network. Chapter 2, ‘Personalised communication in protest networks’, compares two coalitions linked to the G20 London summit of 2009 – the organisation-enabled PPF and a classic collective action network named Meltdown. Despite its more personalised approach, PPF attained a high degree of organisational coherence (p. 78) and remained ‘managed and focused’ (p. 86). Chapter 3, ‘Digital media and the organisation of connective action’ compares once again two 2009 networks. Here, however, both are connective action networks: the crowd-enabled #cop15 protests in Copenhagen vs. the organisation-enabled #thewave in London. By examining in detail two key Twitter practices (hashtagging and hyperlinking), the analysis reveals that the ‘crowdsourced’ gatekeeping of the Copenhagen Twitter stream was no less coherent than that of the organisation-managed London stream. Chapter 4, ‘How organisation-enabled networks engage publics’, compares another pair of action networks: fair trade networks in Germany and the UK. It argues that public engagement as a desirable goal for all action networks is not a given. To establish which conditions favour or inhibit organisation-enabled connective action, we must identify the ‘opportunities and trade-offs in the political environment’ (p. 145). Chapter 5, ‘Networks, power, and political outcomes’ compares the UK’s organisation-enabled Robin Hood Tax (RHT) network with the crowd-enabled Occupy movement in the US. The aim is to examine ‘[h]ow power operates in different kinds of connective action networks’ (p. 149). Bennett and Segerberg introduce the notion of ‘power signatures’ to gauge ‘the degree to which recognition (prestige and influence) is concentrated or dispersed among actors in a network’ (p. 152) who can ‘set conditions on how power is organised’ (p. 155). Despite their different power signatures, both networks managed to ‘change the conversation’ on inequality in their respective nations (p. 165). Finally, ‘Conclusion: when logics collide’, is more than a recapitulation, as it takes up a new issue: the conditions under which internal strife can arise within action networks. Thus, within Occupy ‘fundamentally different ideals and ideologies of organisation and action’ arose over online deliberation technologies during the post-encampment phase (p. 200). This is a remarkable book that doubtless accomplishes its mission of understanding ‘how digitally networked action works in an era of increasingly personalised political participation’. The book straddles the conventional pre- and post-Tahrir divide running through much of the current protest movements scholarship. It also develops an original conceptual vocabulary, spearheaded by the notion of ‘connective action’. In addition, it makes fruitful, systematic use of the comparative method, as well as developing methodological innovations around web crawling and other digital techniques. As if that were not enough, The Logic of Connective Action even wrestles with one of the more vexing problems of social network analysis: its customary inattention to questions of power (see Chapter 5). In doing so, it opens collaborative avenues with social movements scholars currently attacking power from other angles, including field theory. As the authors point out, there are limitations to the network analysis approach adopted in the book, and therefore much scope for future collaboration with ethnographers and other qualitative scholars. The book suffers from two main weaknesses. First, the authors succeed in making the more ‘boring’, technical sections accessible to non-specialists, yet most chapters are rather too lengthy, and there is a fair degree of redundance. The more fundamental problem, though, is the idea that different action networks possess their own ‘logics’ – and indeed that there is such a thing as a ‘logic’ of connective action. Although this idea drives the book, it is left unexplained. In fact, there appears to be a manner of causal linearity in the argument. So long as the analyst can identify the unique logic (or mix of logics) ‘at work’ in a given action network, the rest (digital media, internal frictions, political outcomes, etc.) will follow logically, as it were. In avoiding the technological determinism of cruder accounts, Bennett and Segerberg may have veered too close to morphological determinism by presuming that network form begets contentious action type. This brings us to the perpetual question of agency. Does the power and agency of network participants end at the very point at which they have co-created a given ‘logic’ of action? This is unlikely, suggesting the need for a revised theory of action that can handle the messy, multi-directional causality of contentious politics.